In the late 1980's , following a series of chance happenings, Roger Andrews made the decision to turn his lifelong passion for art and model making into an income generating way of life. By 1991 Andrews Studios had established itself as a sculptural service to private clients, local companies and figurine makers throughout the UK. Andrews Studios continued to acquire commissions from a wide range of sources and was becoming renowned for detailed figurative work particularly in the field of military sculpture. In 1992 Roger acquired a world wide licence to create figurine characters from the "Legend of Lone Wolf" series of novels written by Joe Dever and John Grant. 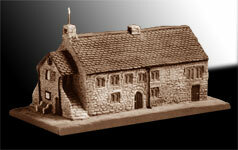 Landmarks quickly became established as the source for high quality figurine and artwork in Wales and was the main wholesale and mail order outlet for the creative and manufacturing output of Andrews Studios. Throughout this time, Roger Andrews Studios continued to accept commissions for figurative work, particularly in the field of military sculptures and the scale of these figures was becoming ever greater. In 2005, Roger accepted a commission from the Durham Light Infantry Association to create two life-size sculptures of the VC winners; 2Lt. Richard Wallace Annand from WWII and Pt. Thomas Young from WWI. The sculptures were installed in the famous South Shields town Hall and were unveiled, to wide acclaim, on Remembrance Day 2006. Many other sculpture commission have followed both for portrait sculptures and public sculptures as well as many private sculpture commissions. Amongst the most noted of Andrews Studios public bronze sculptures is perhaps the sculpture of the renowned Welshman Sir Tasker Watkins VC. 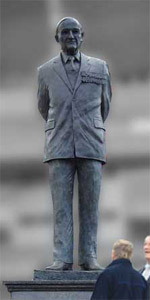 Roger's 9ft bronze tribute, mounted on a granite plinth stands outside the Millennium Stadium in Cardiff. The sculpture has won many plaudits both for the likeness of the subject and the way in which the sculptor is captured the character of the great man. More recently, Andrews Studios has unveiled a 9 foot bronze to another great Welshman, Fred Keenor who was captain of the 1927 Cardiff City side, which beat Arsenal 1-0 in the FA Cup final and brought to Home to Wales, the one and only time that the cup has been won outside England. Roger Andrews was born in Porthcawl, Mid Glamorgan and was educated at Cardiff High School until leaving to pursue a career in Electrical Engineering with the British Steel Corporation. Much of his professional life was spent in the Materials Handling industry until diverting to a career in property renovation and development in the early 80's. Throughout his career he has exploited his innate ability as an artist and sculptor in producing technical illustrations and engineering prototypes. It was no surprise to friends and family when in 1989 he gave way to this life long passion to pursue a career as a sculptor and model maker. Since 1990 Roger has devoted his time to being a full time sculptor and has undertaken hundreds of commissions for public, private and commercial clients.